The popularity of the solar industry is increasing each and every day with advancement in technology. The high cost of living has pushed people to seek renewable sources of energy and as we all know, the sun is free to everyone. 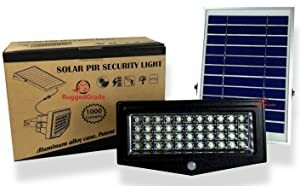 There are various types of solar lights but for the sake of this post will dwell only in solar flood lights. In a niche with over 1000 brands at times deciding what to buy is not always a walk in the park. We will walk you through the best solar flood lights in the market today. This is one of those long but interesting posts get some coffee and get a comfortable sitting positing ready to be informed. Where should you install solar flood light? Flood lights are lights specifically designed to light large areas. The lights are artificial and for a bulb to qualify as a flood light it must have high light intensity usually measured in lumens. 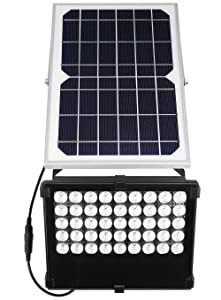 The term solar in solar flood lights means that the lights use solar energy as the source of power. Back in the days before electricity, people used solar energy for lighting. Then technology was not advanced since the bulbs were not bright enough. The best way to go is renewable sources of energy and when it comes to this, the sun is the most effective and reliable source of renewable energy. 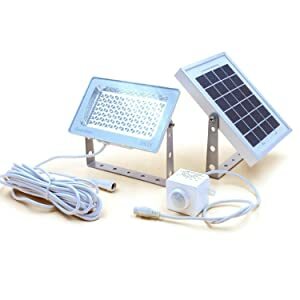 In such a competitive industry, there are a few basic parameters that you should be on the lookout for if you are to get the best solar flood lights. There are thousands of brands out there all claiming to be the best and if you are not careful you might end up purchasing a product that can’t serve the intended purpose. The following are the factors you should consider to ensure that you end up with the best product. Flood lights serve the prime purpose of lighting up an area but the illumination area differs. Different lights have different light intensity. If the illumination area is large then you will need bulbs with more light intensity and vice verse. 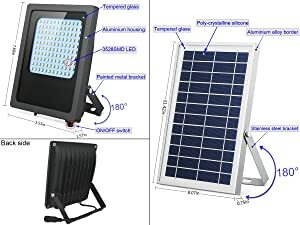 Which are some of the areas that solar flood lights can be used? This can be stadiums, back yard, swilling pool area, parking lot, sports field and concerts just to name a few. The solar flood lights used in stadiums are not the same as those you would use in your back yard. The various types of bulbs each come with its own unique set of features. Depending on where you intend to use the solar flood lights, you should always pay special attention to the features of the bulb. 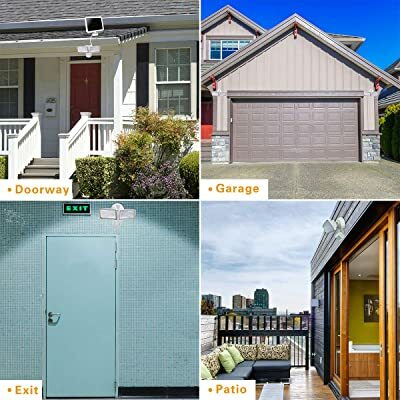 Some of these features include motion sensors, dusk and dawn sensors, and the PIR sensors. Brightness in bulbs is measured on lumens. Before purchasing a solar flood light, read the product label to be sure on the brightness of the bulbs. If you get a bulb with more light for at a less price go for it. What is the essence of purchasing something that will only serve you for only a few months? Most solar flood lights are durable but there are a few less durable and that’s why you must be guided on what to invest your money and time in. As much as we would like to ignore the price factor when it comes to purchasing the best solar flood lights, one thing is certain. We all have different spending capabilities. There are those who would like to go for something cheap but high quality whereas there are those who money is not a problem for them. It’s good to always respect this difference and in our review, we have mixed up things to ensure that everyone’s taste and preference is covered. However, you should always know the following: expensive doesn’t always guarantee high quality and you can’t buy what you can’t afford. 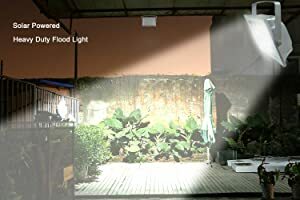 Taking the top spot in our review of solar floods lights is none other than the High Power 1000 Lumen Solar Motion LED Flood Light. This is a spot well deserved. This particular flood light is highly energy efficient consuming just 10 watts for 1000 lumens of brightness. The energy consumption is insanely low and is hard to compete with. High Power 1000 Lumen Solar Motion LED Flood Light is bright enough to light backyards, driveways and parking lots. 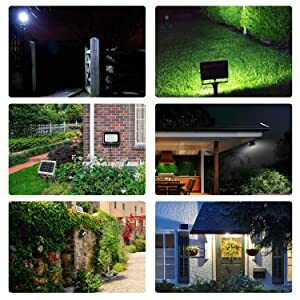 It can also be used as a security light and some even use it to light their living room. The bulb is equipped with light and motion sensors and has a button to control the available models namely: standard, always on 500 lumens, always on 1000 lumens and off light during day time. The presence of highly sensitive light sensors means that the light will turn off at dawn and turn on at the dusk. The motions sensors though not as sensitive as the light sensors work as well explaining why this particular flood light is the top pick. No rocket science is needed to install both the flood light and solar panel. As a matter of fact, you don’t need any prior electric knowledge to install. The menu explains everything. As if that’s not enough, the High Power 1000 Lumen Solar Motion LED Flood Light is equipped with an 8000 mAH lithium battery. The capacity is nearly twice that of ordinary flood lights. For an extended area application with high PIR sensors then you should consider getting the Guardian 580X Solar Security Floodlight. At full brightness, the bulb grows for 730 lumens. Compared to some bulbs this is relatively low but given the fact that it only consumes 6 watts, this is very economical. The PIR sensors are attached separately and detect even the slightest movements. The sensors cover a range of up to 10-12 meters which considered nearly three times the distance ordinary flood lights can cover. The battery is has a capacity of 25000 mAh which is pretty high given the low power consumption. Guardian 580X Solar Security Floodlight is available in 3 different lighting modes. The green LED lighting from dusk to dawn and when this mode is turned on the PIR sensors are usually off. The blue LED where the bulb is at full brightness and the red LED. Under the red LED the lights are off when there is no motion but turns on immediately once the PIR sensors are triggered. If you want a flood light to give you maximum coverage in all directions then you should consider purchasing the Sunforce 82153 150-LED Triple Head Solar Motion Light. This particular flood light has coverage of 180 degrees and is easy to adjust to suit just any coverage. It is ideal for all locations and the fact that the model is all weather resistance means that its durable will serve the intended purpose without the necessity to replace it. It solar is made of amorphous which are very sensitive to light. The solar doesn’t need direct sunlight; it will convert light to energy even when it’s cloudy and or over winter. Sunforce 82153 150-LED Triple Head Solar Motion Light has 2 lighting modes. The distance detection mode and light duration mode. CYL 60 LED Lights Outdoor Security Floodlights has been in the market for quite some time and there are no signs of slowing down. The floodlight illuminates 300 lumens of light which is pretty awesome for a security floodlight. It has 120 degrees of coverage and has its battery as its strength. With a capacity of 4000 mAH when full the lithium rechargeable and replaceable battery can give up to 16 hrs of light. CLY 60 LED Lights Outdoor Security Floodlights is waterproof and can withstand just any kind of weather. It is easy to install and is equipped with light sensors that turn on at dusk and turn off at dawn. 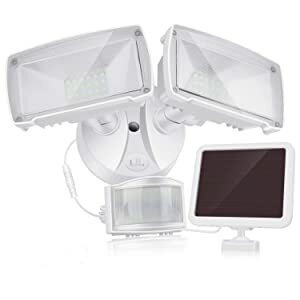 For top-notch flood lights to serve just any purpose you should consider purchasing the LED Solar Motion Sensor Flood Light. 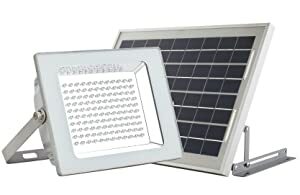 To begin with, both the solar panel and the flood light is easy to install. Everything is explained in the menu and no prior electric knowledge is required. It has two identical flexible headlights to ensure maximum coverage. With these lights, you can cover up to 180 degrees. If you thought that a 3-meter cable was long then you should see the 4.5-meter cable in LED Solar Motion Sensor Flood Lights. The bulbs are bright enough to cover a distance of 45fts. The PIR sensors detect any kind of motion and there is an option to set it always on. This means that the lights will always turn on whenever there is motion detected even during the day. The battery has a capacity of 2200 mAH which is not all that great but decent given the fact that it has an amorphous solar panel that can charge even on a cloudy day. 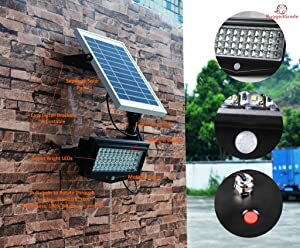 Illuminating 500 lumens and with a battery capacity of 4000 mAH Microsolar Heavy Duty Light Fixture is definitely a top pick of the best solar flood lights. This brand comes with a good cable that is of length and the adjustable bracelets make it possible to adjust the angle of positioning for maximum coverage. It affordable and made from durable and waterproof material. 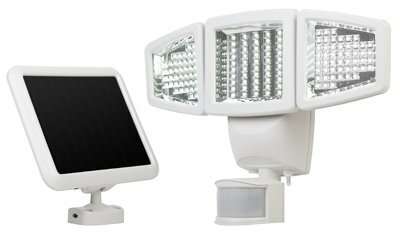 There are only a few solar flood lights that have a battery capacity of 8000mAh and Sunbonar Solar Flood Light falls in this unique category. The battery is protected from discharge and overcharge by a unique software. This means that the battery itself lasts longer. Ideally, this is usually 3-5 years. More than twice what average flood light batteries can offer. Sunbonar Solar Flood Light has inbuilt non-tech reflectors that increase brightness by 30%. It is made from durable material that doesn’t break easily even after falling and is waterproof. It also has motion and light sensors and its appropriate to use both indoors and outdoors. The cable is 16.4fts long which a decent length. One has one lighting model. 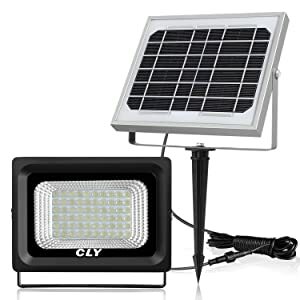 Closing up our list of the best solar flood lights is Solar Lights Outdoor 120 LED Flood Lights. Given its features, it would have been unfair to snub this all-time classical a chance to be on this list. The flood light is considered extremely bright and energy efficient. Consuming just 6 watts you will get 800-1000 lumens which pretty awesome. It is water proof and as accessories, you will get a 16.4fts power cable. 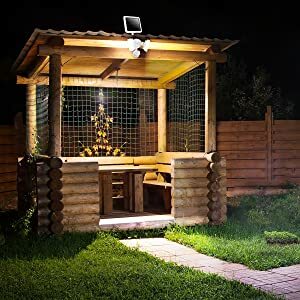 Don’t let the name fool you, Solar lights outdoor 120 LED Flood Light is used both indoors and outdoors and has a battery capacity of 6600 mAH. Choosing the best solar flood lights is just half the piece. You still have to install it. With this comes the question for the day. Where should you install solar flood light? Solar flood lights serve different purposes and can be used both indoors and outdoors. One of the ways of installing solar flood lights is mounting it on the wall. Most brands have the necessary accessories to install but even it does n’t come with the original packaging the accessories can be bought on local electronic shops. 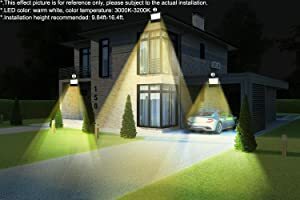 There are also those who prefer mounting their floodlights on the ground especially for security and when they don’t want them to be detected. 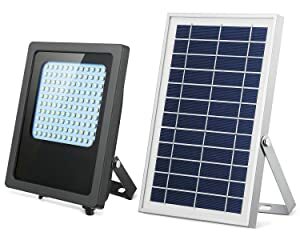 The initial cost of purchasing solar flood lights might seem expensive compared to ordinary bulbs but here is the deal, with electricity powered bulbs every month you have to incur extra cost in the form of a bill. On the other hand, solar flood lights are powered by the sun which is free. No one will ask you to pay taxes to harness the sun or will there come a time and the sun will disappear completely. Well, literally since the same cannot be said for regions that snow during winter season. Nevertheless, solar flood lights are cheap. Solar flood lights are bright enough to lights a stadium or football pitch. The brightness is calculated in lumens and not even electricity powered bulbs compared to the brightness. Though we have electricity derived from water in power form the two should never get into contact. Almost every electric bulb will blow off when it comes into contact with water. 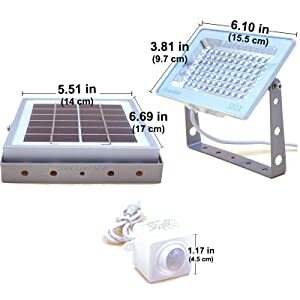 The same cannot be said about solar flood lights which are waterproof meaning that you can use them just anywhere. How can you compete with that? Short circuits are very rare with solar energy. Most solar flood lights are durable and can give you up to 10 years of service. Unlike most electric bulbs that short circuit due to frequent switching and off. It is my sincere hope that you found this post in informative and useful. Sometimes you just need to be pointed in the right direction for you to get the best product in the market. This particular flood light is highly energy efficient consuming just 10 watts for 1000 lumens of brightness. The energy consumption is insanely low and is hard to compete with. It is bright enough to light backyards, driveways and parking lots. The bulb is equipped with light and motion sensors and has a button to control the available models namely: standard, always on 500 lumens, always on 1000 lumens and off light during day time.